Every user who conducts a lot of activities in SELFLLERY brings value to the platform. Therefore, SELFLLERY rewards such users with YOU tokens. The YOU token entitles its holders access to paid services on the SELFLLERY platform, to make purchases in the SELFLLERY marketplace and stock gallery, donate to charities, and make internal transfers and withdraw tokens to Ethereum wallets. comments and views of the user photos. 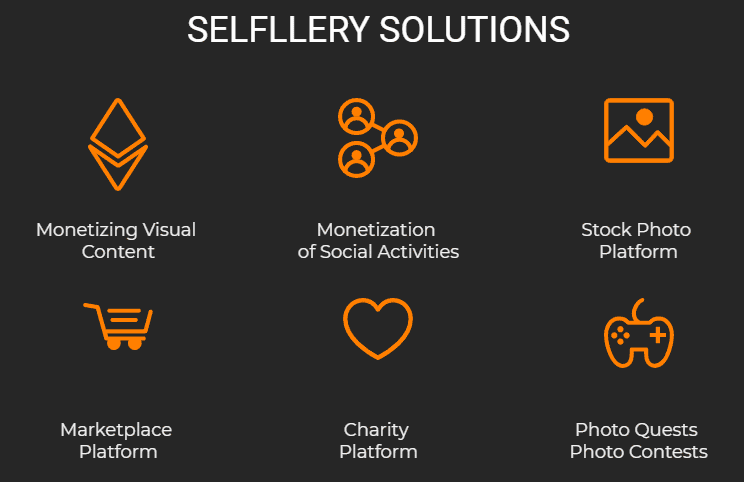 SELFLLERY incorporates a charity program, where any SELFLLERY user can determine the percentage of donations from their income to a charity of choice. SELFLLERY users get access to the SELFLLERY marketplace where they can purchase related products (cosmetics, selfie sticks, smartphones, etc.) and services (cosmetic procedures, plastic surgery, photo prints etc.) with YOU tokens or other cryptocurrency. Suppliers are required to complete authorization process. Supplier catalog will show their ratings, escrow and reviews. SELFLLERY regularly creates photo quests – single- and multiplayer games for photographers. In a photoquest, users are tasked with making photos of certain objects, animals or scenes within a limited period of time. Photoquest may include several tasks with different levels of complexity. After completing all the tasks, the player can receive a prize in YOU tokens. In a multiplayer photoquest, several players can participate simultaneously . SELFLLERY provides advertisers with a marketing tool set that includes games and contests. The brand or company owner can launch a photo contest between users and specify custom conditions that would attract attention to the brand. Blockchain provides transparency of the contest as advertisers will use smart contract to specify the contest terms and rewards distribution. Participating in games and contests, users can get additional Likes, increase their photo ratings and receive rewards in YOU tokens. The reward amount is calculated in the following way: the more participants enter the contest, the larger the prize pool. SELFLLERY provides a multipurpose stock photo to upload and sell digital photos. Payments in the stock gallery are made with YOU tokens. All stock gallery users are required to complete verification.